Davis Cup panel including Jim Courier at Belmont University Nashville, Tennessee, April 2, 2018. 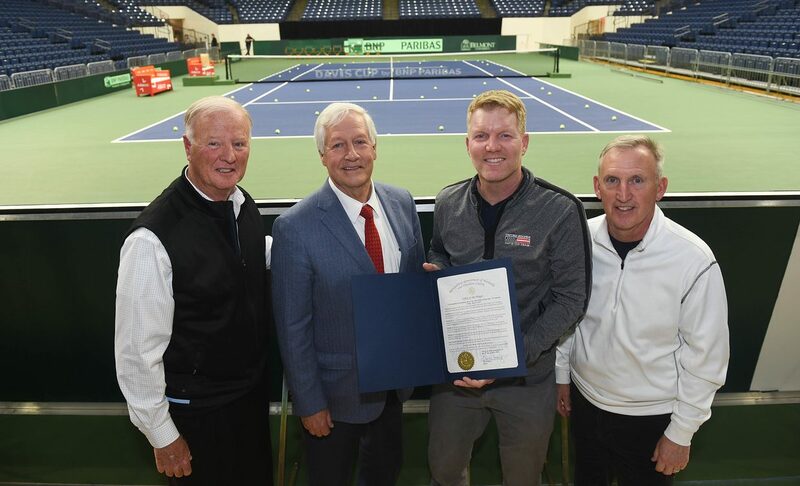 Nashville Mayor David Briley recently declared Friday, April 6, 2018 as Davis Cup “Red, White & Blue Day” in Nashville in honor of this weekend’s international tennis event at Belmont University’s Curb Event Center. The proclamation notes that Davis Cup is widely considered the World Cup of Tennis and is the largest international team competition in sport with approximately 135 nations competing each year. Citizens throughout the city are encouraged to don their patriotic red, white and blue on Friday in celebration of the first day of competition for Team USA. The USTA announced in February that Belmont University was selected as the host site for the 2018 Davis Cup by BNP Paribas World Group Quarterfinal between the United States and Belgium, April 6-8. The event represents the first time Davis Cup competition has come to Nashville in 40 years. The best-of-five match series between the U.S. and Belgium begins on Friday with two singles matches and Saturday’s schedule features the pivotal doubles match. The final day of play on Sunday features the two “reverse singles” matches. All matches are best-of-five tiebreak sets; the first country to win three matches wins the tournament. A revised schedule for Sunday may take place if a team clinches in the third or fourth match. The USTA and United States Davis Cup Captain Jim Courier announced March 21 that world No. 11 Jack Sock, No. 14 Sam Querrey, No. 17 John Isner, No. 53 Ryan Harrison and No. 54 Steve Johnson, will represent the U.S. in the Quarterfinal. The USTA has partnered with Belmont University, the Nashville Sports Council, and the Nashville Convention and Visitors Corporation to bring this event to the city. Local sponsors include Enterprise Solutions, Wyatt Johnson Automotive Group, and PepsiCo. Tickets are still available for this weekend’s competition at www.usta.com/daviscup.